Football player Carlos Watkins says he owes his life to the first responders who rescued him in 2013 from a car crash. One of them is Duke Energy lineworker Scott Wheeler. 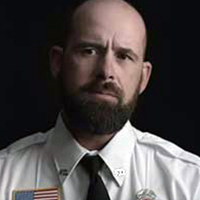 Watkins tells his story in Verizon Wireless’ national advertising campaign honoring first responders. Verizon features 11 NFL players and one coach whose lives were saved by first responders. Watkins and Wheeler appeared in a commercial shown during the NFL’s championship game on Feb. 3. Wheeler started working as a volunteer firefighter almost 20 years ago to help members in his community. Being able to help people during their time of need is what has kept him going after all these years. 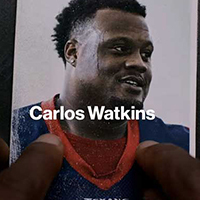 An image of Carlos Watkins in the ad. At the time of the crash, Watkins of Mooresboro, N.C., was a defensive lineman for Clemson University who was on his way to a cookout with friends. The driver lost control and hit a pole, killing one of Watkins’ longtime friend. Watkins was trapped in the car. He suffered life-threatening injuries, including two blood clots, which could have meant the loss of both of his legs, had it not been for the first responders. All the full-length commercials are available on Verizon's All Our Thanks campaign website; Wheeler’s ad is titled “Carlos Watkins.” As part of the campaign, Verizon will donate up to $1.5 million to First Responders Outreach. There also is a documentary from the first responders’ points of view, airing on Yahoo! Sports starting Feb. 7.